Created by John Robbins, owner of a SIGNARAMA franchise in California, this clever tool is used for trimming around windows and is especially useful for finishing perforated window wrap installs. 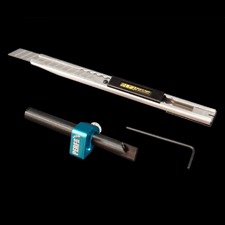 The tool assists installers with cutting a symmetrical ⅜-inch gap around a window for a clean, finished application. Many film manufacturers actually require perforated vinyl to be installed with a gap like this for a valid warranty. This tool attaches to the OLFA Stainless Steel Breakaway Knife, which is typically sold separately. This is a video that Fellers, the world's largest wrap supply company, asked The Wrap Institute to make for their catalog. This is not a paid endorsement for this product.